We all know that flying with kids is never going to be the best part of getting away. As much as we look forward to all the fun of a family vacation, there’s always a little apprehension about the journey, especially getting through the airport. There are so many things to remember and so much baggage to carry that just getting everyone to the gate in a safe and timely manner can be a real undertaking. Amongst all the suitcases and other baggage to be checked will be the kid’s car booster seat, ready for the onward journey at the other side. Y ou’ll be glad to hear that most US airlines will let you check car booster seats at no extra cost. However, be aware that the same won’t necessarily be true for their international counterparts. Whilst most airlines will carry booster seats as free checked baggage, some will deduct the weight from your overall allowance. This could mean a costly revelation at the check-in desk, by which point it will be too late to do anything about it. 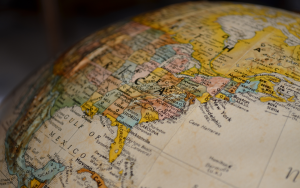 When flying from the US, it could be useful to familiarise yourself with the advice for travelers from the FAA. This also has some useful general information on flying with children. Baggage gets damaged or broken all the time in the aviation industry, to avoid this happening to your car seat leaving you with a tricky situation on the other side, we’ve found that there are some simple steps you can take. Many of the larger airports will have an automated or manual wrapping service for passengers. But make sure to check with the airport before traveling because the availability of this service varies widely. If the airport doesn’t offer this service, you can roll up your sleeves and do it yourself. First wrap the car seat with several layers of heavy duty bubble wrap, with extra coverage for protruding parts which are more vulnerable to damage. Then, cover the whole seat in thick stretch film or pallet wrap, or if you aren’t able to get your hands on that, you can place it in a durable waterproof bag and seal it well. This will help to protect the seat from water damage which is always a possibility for items stored in the hold. be forgiven for thinking that lugging a bulky, cumbersome car seat back and forth across the airport, is just an inevitability of traveling with kids. But not so! 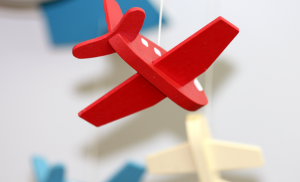 There are more portable alternatives which can make flying with children a bit less of a physical strain. 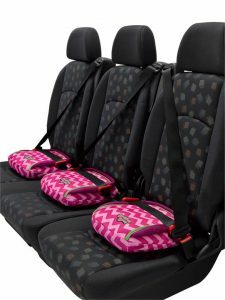 If your child is between the ages of 4 and 11 the BubbleBum inflatable car booster seat offers a portable, lightweight option, which simply deflates to fit into your purse, rucksack, suitcase, or carry-on. The BubbleBum booster seat is fully compliant with the US federal safety requirements (FMVSS213) Federal Motor Vehicle Safety Standard No.213 and approved for the EU under the United Nations ECE Regulation R44/04 for safety for Groups 2 and 3. As you know, if your child is under the age of 4 they’ll need a five-point harness seat which will typically be more bulky and difficult to maneuver, but there are also some on the market which have been designed with portability in mind. The HY5 by Nachfolger is a nice example of this and is worth a look if your child isn’t yet old enough to benefit from BubbleBum. It claims to be the lightest kid’s car seat available in group 0/1, and has been designed with safety and portability in mind… it looks pretty nice too! We’ve all been there; no matter how meticulous you have been in packing for a vacation, you arrive at your destination only to discover that you’ve forgotten something important. It might be something that’s easily replaced like a toothbrush, but equally, it could be something altogether more problematic, like a key component of your car seat. Imagine, for example, that your car seat has a base unit; you probably haven’t given much thought to its construction since the day you first assembled it. As a result, there’s every chance you might miss an essential clip or crucial component which could prove very difficult to replace when you arrive at your destination. If you still have the instruction manual that came with the seat, it will give you a checklist of all the components you will need, otherwise these can usually be found online if you’ve misplaced the original. Reassembling these car seats can be quite complicated too, so if you have the time it might be a good idea to practice assembling and disassembling it a few times to refamiliarize yourself. Children’s safety is non-negotiable, even where it isn’t the law! “Crossing a state line doesn’t magically make your child invincible, not even at DisneyLand,” says BubbleBum founder Grainne Kelly. The legal requirement for transporting children varies from state to state and country to country, but one thing that doesn’t change is the increased risk of injury faced by children if they are not seated in an appropriate booster. This is even more important when on vacation for a number of reasons; you probably won’t be familiar with the roads, you may be tired from traveling, you might be driving on a different side of the road (or car!) than you’re accustomed to. All of these factors can increase the risks associated with driving whilst on vacation, making it even more crucial that you use the appropriate safety restraints. Hopefully, these tips will come in useful the next time you find yourself faced with checking a children’s car seat at the airport. 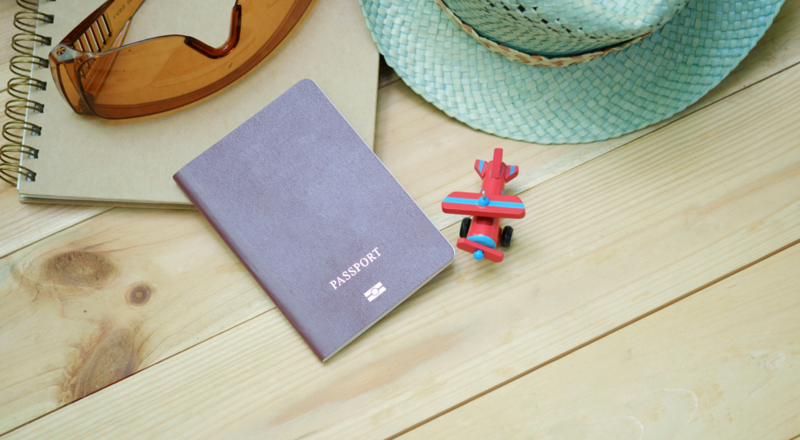 We’d love to hear your experiences of traveling with children, and any tips you think that we ought to know. Want to get your own portable, inflatable, kids booster seat? Pop over to the BubbleBum store to check out all of our colors and designs.